Martha Sandven already had two degrees but she wanted another one to increase her focus on integrating arts into her teaching. She was chosen to receive this year’s College of Education and Health Professions Outstanding Alumni Award in Education. She saw that many students were not proficient in reading and writing. They believed reading was not relevant and writing was a specialty skill instead of a normal way to communicate, Sandven said. She also noticed that middle-level students were most at risk of making poor decisions that would affect the route they took academically and, ultimately, economically. Sandven studied the effective use of readers’ theater in the classroom for her Master of Arts in Teaching degree in secondary English. She already had gotten a first master’s degree after her undergraduate degree. She began teaching in Northwest Arkansas in 2008 and now teaches seventh grade pre-AP English and English/Language Arts at Ramay Junior High School in Fayetteville. Sandven said the award was important because people working in education often feel underappreciated, but it also represented a team effort. She started programs such as Page to Stage, to help students write and perform their own creations, The Breakfast Club after-school art and drama program for youth at Ramay Junior High and the WONDERS of Reading! initiative to “create a culture of kindness, empathy, and literacy” among junior high students. Sandven mentors first-year teachers and pre-service teachers in the U of A M.A.T. 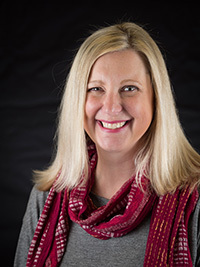 program, and she recently collaborated with U of A faculty to secure a federal grant implementing the National Writing Project’s College, Career and Community-Ready Writer’s Programs for High Need Schools at Ramay. She earned her National Board Certified Teacher designation in adolescent literacy. She has received a Point of Light Award from former President Bill Clinton, a Walton Foundation Quality of Life grant through the Fayetteville Public Education Foundation, a Secondary Mentor Teacher of the Year award from the University of Arkansas, an Above and Beyond Award from the Fayetteville Chamber of Commerce and the Fayetteville Public Schools Board of Education, and the Teacher of the Year Award from Ramay Junior High School.